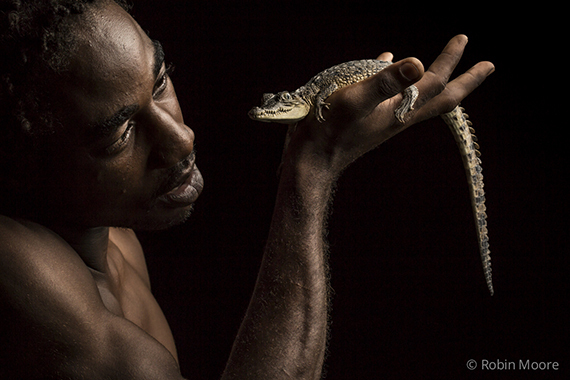 "You've got to respect another life, so that the other life can respect yours," says Booms, a young Jamaican who has devoted the past seven years of his life to protecting some of the rarest reptiles in the world. "Some of my friends think I am crazy, when they hear that I am touching the iguanas and the crocodiles. But if they were here like me, they would understand, and they would do everything that I am doing." Image: "Booms" cradles a young American crocodile, a threatened animal found during a nighttime search with flashlights in a mangrove lagoon in Portland Bight Protected Area. Booms, who grew up in Kingston, found his calling in the Hellshire Hills. "It's easier living to me. Entirely. I love being here," he says, pausing before adding, "I hate not being here." As we sit in the shade of small field station surrounded by limestone forest, a six-foot long, leather-brown iguana ambles towards us, its tail scattering dust as it swings from side to side, and flops onto the floor near our feet. 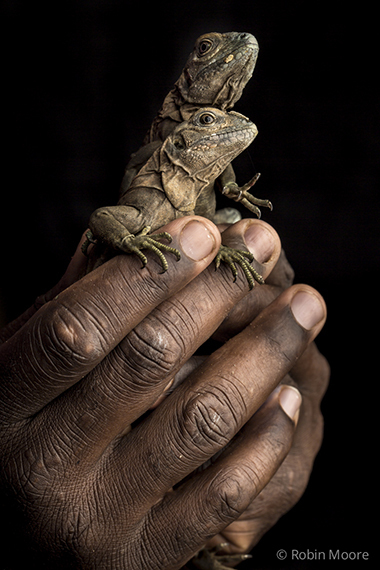 The Jamaican iguana story is a fascinating one. The largest land animal in Jamaica was long believed to have gone extinct after being last sighted on Goat Islands, two small cays south of Kingston, in 1948. Until 1990, that is, when a hog hunter chanced upon a live iguana in the Hellshire Hills; around 50 survivors of the "rarest lizard in the world" were subsequently found to be hanging on. Image: Young Jamaican iguanas are raised in a facility in Kingston to see them through the most vulnerable months before being released back into the wild -- a process known as "headstarting." 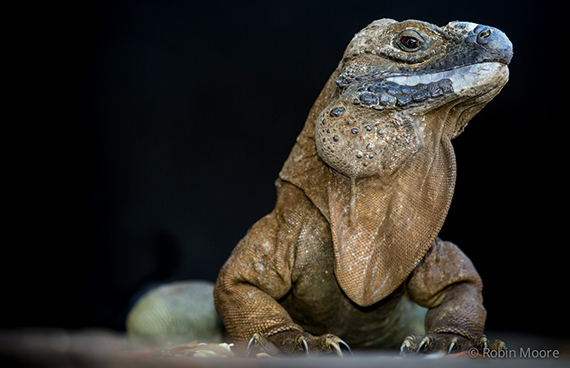 Following its rediscovery the iguana became a flagship for conservation in the West Indies, and the focus of an international recovery program. A headstart facility was built in Kingston to rear eggs and hatchlings brought from the wild, so that they could be released back into the wild once big enough to ward off predators. The program was a success. Image: The critically endangered Jamaican iguana, Cyclura collie, was described as the "rarest lizard in the world" after its rediscovery in 1990. It has become a flagship for conservation in the West Indies and the subject of an international recovery program. The recovery of the Jamaican iguana has been aided by the creation in 1999 of the 187,515 hectare Portland Bight Protected Area, which contains one of the largest dry limestone forests in the Caribbean, the largest intact mangrove forest in the country, and 20 globally threatened species. 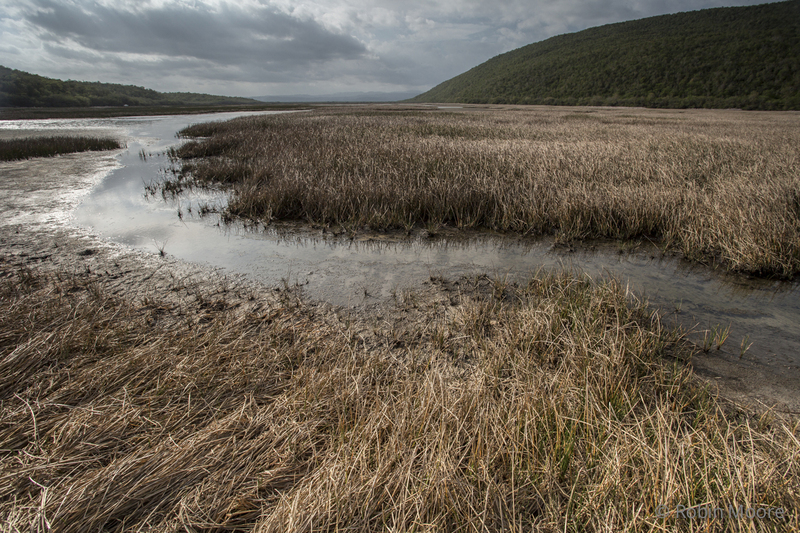 The area was deemed so special that it was under consideration as a UNESCO Biosphere Reserve, until last year when the government backtracked on the proposal, signifying an ominous change of plans. The government announced in August that it was engaged in negotiations to sell Goat Islands to the China Harbour Engineering Company to build a massive transshipment port and associated logistics hub, right in the heart of the Portland Bight Protected Area. 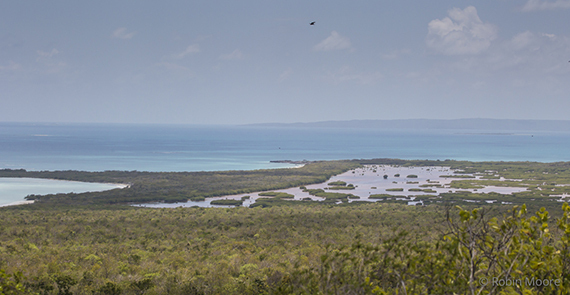 Image: A view from the Hellshire Hills of the Portland Bight Protected Area, containing one of the largest dry limestone forests in the Caribbean and the largest intact mangrove forest in the country. Portland Bight Protected Area is home to a population of 50,000 fishers, whose livelihoods will be devastated by the development. But only the brave in Jamaica dare speak out against the proposed sale of Goat Islands, risking accusations of xenophobia. Dr. Byron Wilson, who has devoted over a decade of his life to protecting the Jamaican iguana and in recent years has jeopardized his academic career at the University of the West Indies by expressing opposition to something that will see more than twenty years of hard work "go up in smoke." As we sit on the remote Manatee bay under a full moon, staring into a star-filled sky over the Caribbean he says, "The plan since the 1970s has been to clear Goat Islands of introduced predators and create a safe haven for threatened native species such as the iguana. That has been the dream. I probably won't want to come back here soon. I just can't stand the thought of sitting here, and hearing dynamite exploding over there," he points in the direction of Goat Islands as he talks, "and seeing plumes of smoke over the horizon. I just can't do it." 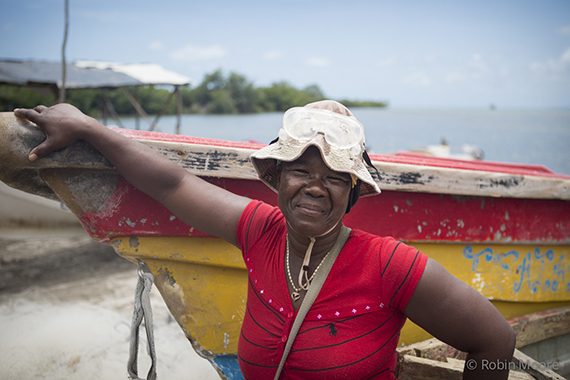 Image: Paulette Coley is the only registered fisherwoman in Old Harbour Bay, and an outspoken opponent to the proposed development of Goat Islands for fears of negative impacts to their livelihood. Joining Wilson in the fight to oppose the development is Dianna McCaulay, founder and CEO of the Jamaica Environmental Trust. "All our Access to Information requests for the technical proposal or the Framework Agreement between the Government of Jamaica and Chinese investors for this project have been denied. We have therefore filed legal action requesting leave to apply for judicial review of these decisions and are awaiting a court date," McCaulay tells me. Image: A unique wetland among the Hellshire Hills, an area that will form part of the proposed logistics hub. Questions loom as to why Portland Bight Protected Area has been selected for the port when other options, such as Kingston Harbour, exist. I ask McCaulay what, if anything, could change the government's mind. "International media attention" she replies. The tourism industry in Jamaica accounts for over 50 percent of the country's total foreign exchange earnings, and provides about one-fourth of all jobs in Jamaica. If negative press around the sale of Portland Bight Protected Area could influence whether tourists choose to visit Jamaica or take their vacations elsewhere, this just could tip the scales in averting an ecological catastrophe. 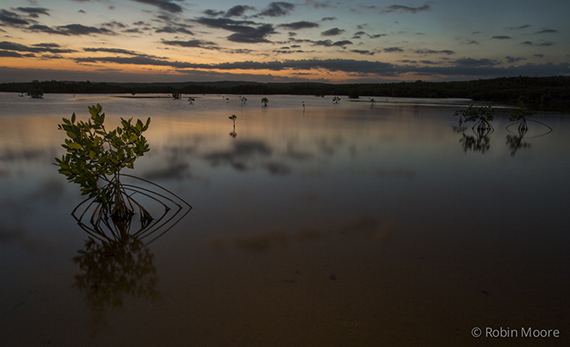 Image: The Portland Bight Protected Area contains the largest intact mangrove forest in Jamaica. To voice your opposition, please share this with the hashtag #savegoatislands and join the movement to save the Portland Bight Protected Area. Click here to sign the petition to save Goat Islands.